Did you know that the first emoji was created in Japan in 1999? Ever since, emojis have become a part of our everyday lives. Whether you use them in your texts, social media posts or wear them on your clothes–they’re here to stay! 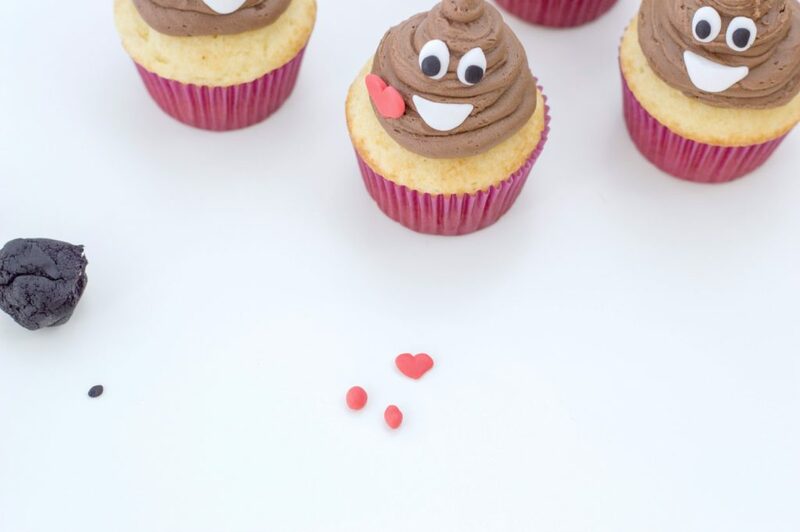 One emoji that is incredibly poop-ular is the poop emoji. 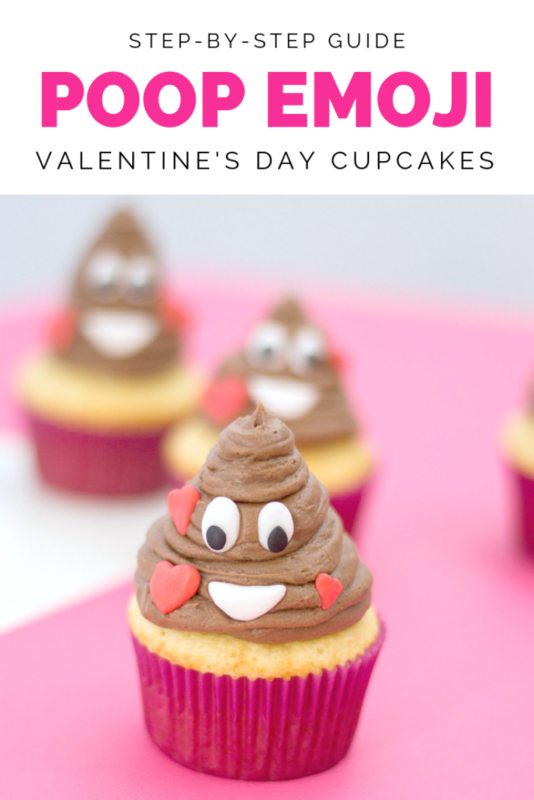 That’s why I just had to share this super easy Poop Emoji Cupcakes with you all. Kids and adults alike love this emoji. My kids have stuffies and toys and I’ll be the first to admit, I love using it in my texts! It’s come a long way from a little steaming pile with flies, hasn’t it? If you want some other fun and delicious recipes, check out these Red Velvet Truffles, Keto Chocolate Covered Strawberry Fat Bombs, and keep an eye out for Valentine’s Day Rice Krispies Treats. 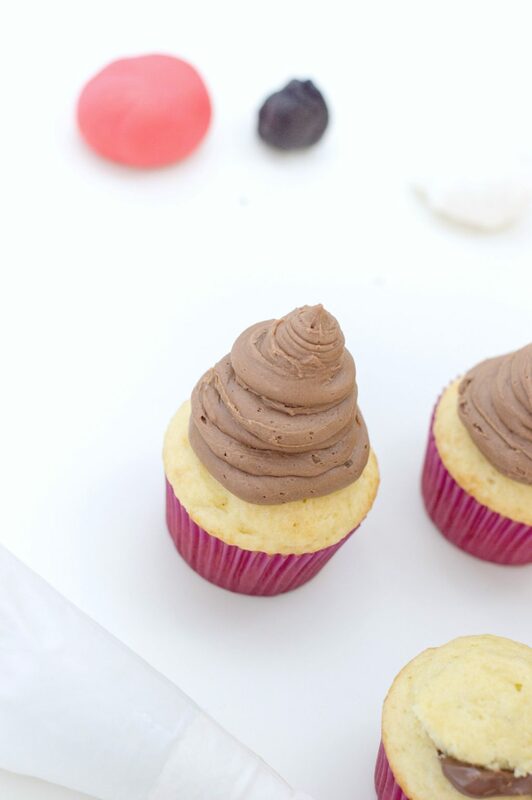 Read on for the step-by-step guide on making these super cute and delicious cupcakes. Perfect for your next emoji birthday party or a funny office treat! 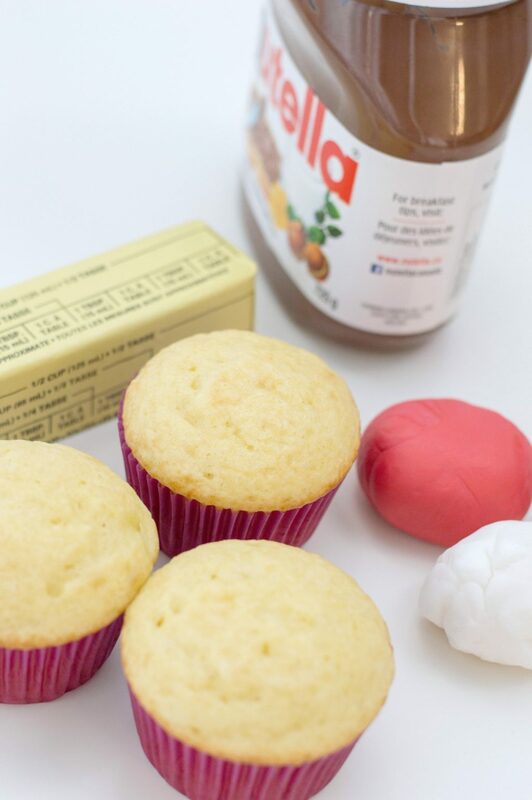 Use your favourite recipe to make cupcakes. You can use your imagination and make them vanilla, chocolate, red velvet, or even organic birthday cake! Just make sure to allow your cupcakes to cool completely before decorating. 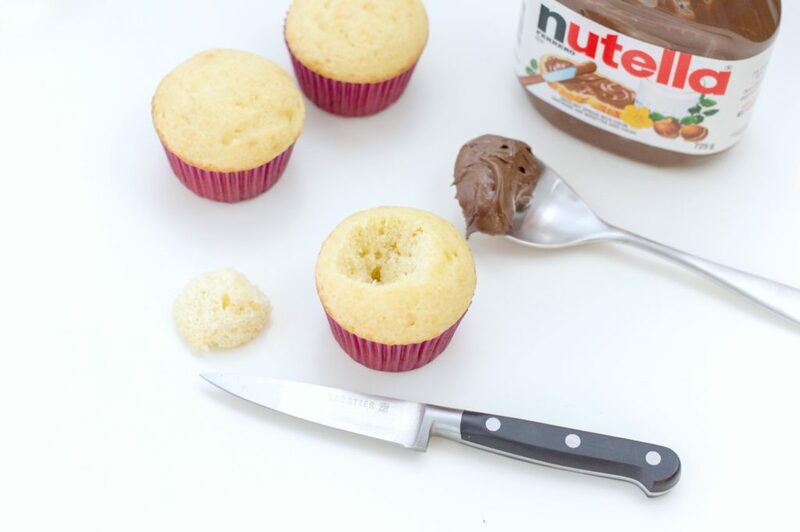 Using a paring knife, cut out the center top of each cupcake and remove. Save the tops – you’ll need them to top your cupcake after the next step. 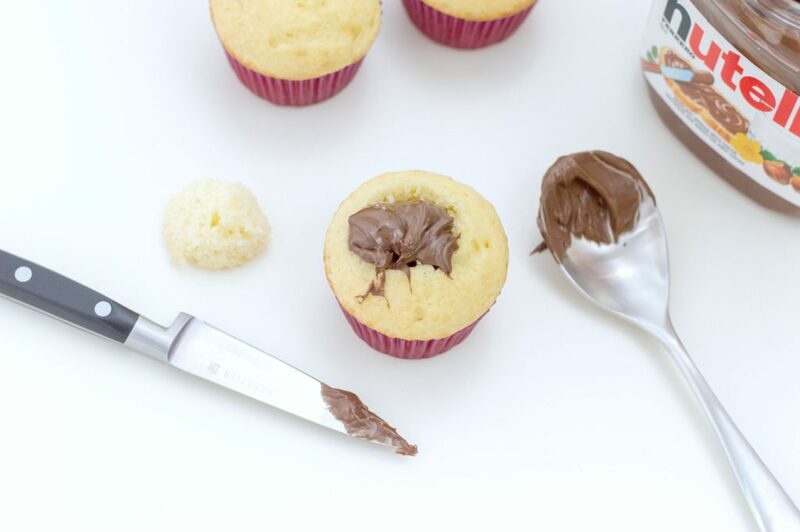 Fill each cupcake with a tablespoon of Nutella/hazelnut spread. Top with the piece of cupcake you just trimmed off. In a medium-size bowl, beat together butter, icing sugar, milk and cocoa to make your buttercream. It is best to use an electric mixer for this. Beat the ingredients on slow and gradually increase to high. 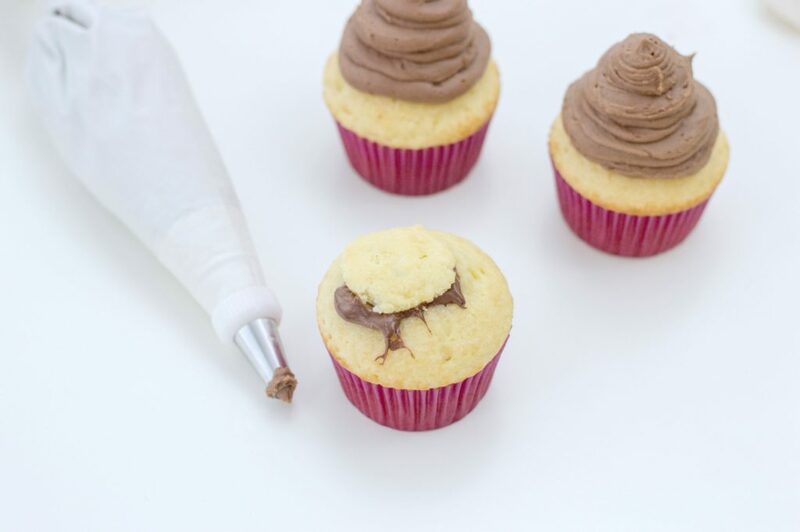 Once the buttercream has formed, scoop into a piping bag and frost each cupcake. Form 24 small ovals with your white fondant. Shape 24 tiny black circles with your black fondant and place one on each white fondant. These will be your poops’ eyes. Place two on each frosted cupcake. 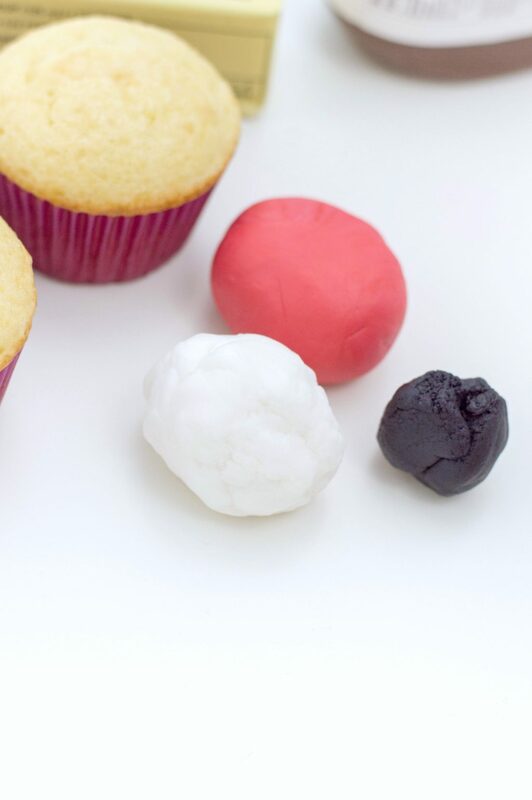 Form 12 ¼ inch spheres from your white fondant. Form them into ovals and then give them to pointed ends. These will act as your poops’ smile. Place one on each frosted cupcake. Make fondant hearts out of your red fondant. Place 1-3 on each cupcake. 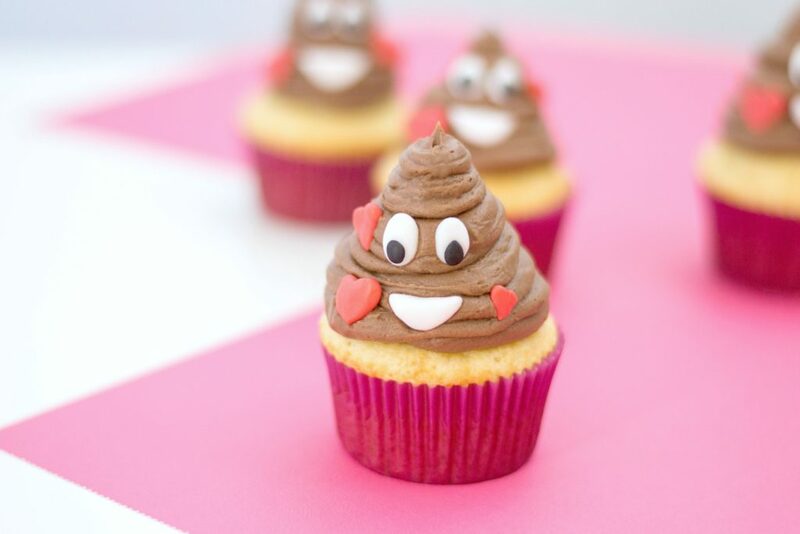 Nutella-filled poop emoji cupcakes. Perfect for kids, holiday school treats, or even funny office treats. So simple but, fun! There you have it folks, this is a fun twist to cupcakes and super easy to make. 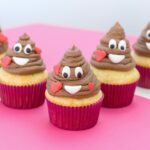 You can whip up these poop emoji cupcakes for kids birthday parties, office treats, school treats or just for fun! My grandsons would love these cupcakes. I have to say that they are cute and look just like the poop emoji. I’ll have to use your recipe and make these for the kids. Ohhh how cute and what a conversation starter! 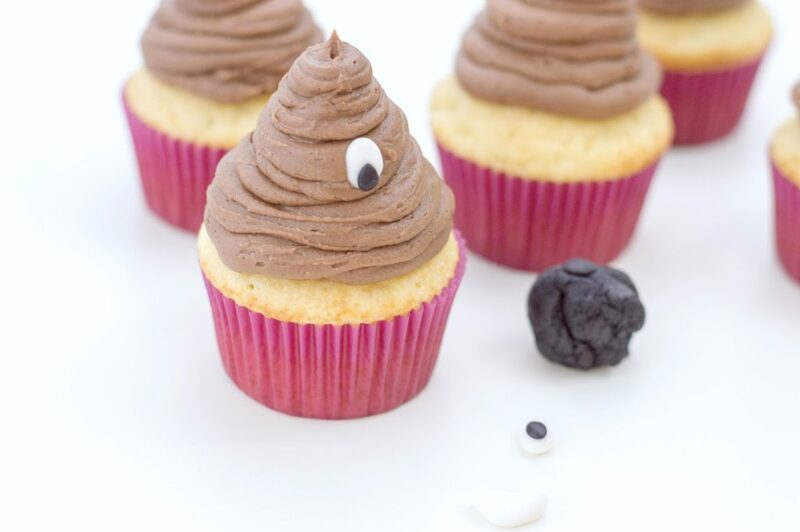 My family is big on the poop emoji, so I’m making these for sure. LOL, we love the poop emoji too! I can only imagine the conversation and smart remarks if I were to make these for my household of people. They are easy to make. LOL, it may all be worth it! These are super cute and I know the kids in the neighborhood would crack up with these! Yesss, the kids love them. oh my goodness i could never get mine to look like this- extremely talented with this cupcakes! It is all about the tips, and practice. Those are so cute! These would be perfect for any kid. Kids are obsessed with poop for some reason. I love the eyes you put on them. Yes, you got it dead on! That looks like a lot of fun to make! My kiddo is so into this emoji its hilarious. I might just have to make it for the fun of it. I can just hear the giggles, and sounds, especially little boys would make when you serve these. OMG, yes! The kids love them–the adults are the ones that cannot get past poop. Those are seriously almost too cute to eat. My boys are ALLLLL about the poop emoji, so they would LOVE these. Oh these are so much fun! My kids would go crazy for them, they would think they are so funny! I might try them! They are funny for us adult because, poop. But, kids love them. This looks like a lot of fun to make and yummy! My kiddos are huge fans of cupcakes. I know what I’m making for my daughter’s next birthday party. She will absolutely love them! Adorable cupcakes! 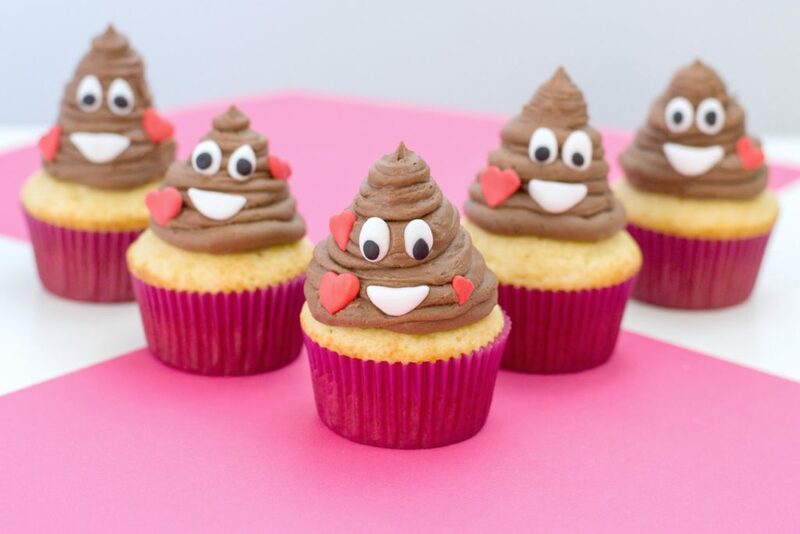 We’re hosting our little girl’s first birthday in April and these would be perfect since the poop emoji is her big brother’s favorite one to use. Awww, this is great for them! Those are so cute! But I don’t think I’ll ever have the guts to eat poop. LOL. Just kidding! Love the creativity of those cupcakes. LOL, they are perfect for the emoji lover. If you love the poop emoji, this is for you but, I feel ya! One of my friend’s kids wanted to have an emoji themed birthday party. These would be perfect for that! Yes, for the emoji lover! Aww this are super cute cupcake it put smile on my face upon seeing it. I just can’t wait to make it for my niece birthday part next week. She should be so thrilled to see it thanks for sharing this great creation. Awww, they are for emoji lovers! Those look sooo awesome and I bet they weren’t too hard to make. You did a great job on the frosting. My kids would LOVE these.